As modern people living in a non-Jewish culture, we know that so much of the richness and depth of God’s Word can get lost in translation when we read the Bible. 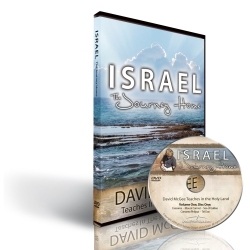 That’s why we want to help bring the Scriptures to life for you by sending you a copy of Pastor David McGee’s 3-DVD teaching series Israel: The Journey Home – filmed on-site in the Holy Land. Travel with Pastor David through the land of the patriarchs, the prophets, the apostles, and our Lord Jesus to see the Scriptures burst from the pages of your Bible in living color. Israel: The Journey Home is our way to thank you for your gift below to help more people around the world cross the bridge from death to life through straightforward, easy-to-understand teaching from God’s Word. So thank you for giving generously to help touch more lives with God’s transforming truth! mp4 instant download, with my full gift supporting Cross the Bridge. Limit 1 per person. Limit 1 per household.